Anytime you are making a whole chicken entrée or a soup using a whole chicken you have the opportunity to make a completely different meal using the left over meat. This is one option but there are so many more – like Flautas de Pollo or Chicken Salad with a Poppy Seed Dressing. The recipe includes homemade Pico de Gallo and Avocado Salsa, so make sure you have the ingredients. Round out the meal with Mexican Rice. Make Pico de Gallo and Avocado Salsa and refrigerate until ready to serve. Both should be used within 3 to 4 hours. Pour vegetable oil into large bowl. Dunk each tortilla into oil, then place on a cookie sheet sprayed with non-stick spray, abut 6 tortillas per sheet. Bake in a preheated oven at 375 degrees for 10 minutes. Check often to make sure tortillas do not roll, if they do flip tortilla and finish cooking. Remove once crisp and golden brown. Be careful when removing cookie sheet due to the excess oil on sheets. Take excess oil and transfer to a medium sized skillet. Place tortillas on paper towels to remove any excess oil. In the medium sized skillet with oil, heat over medium high heat. Add diced onion and sauté until translucent. Add black beans and stir for about 5 minutes. Then mash beans with potato masher until smooth consistency over medium high heat. The beans will become thicker as the liquid is cooked and absorbed to a spreadable consistency. Assemble right before eating to make sure they do not get soggy. 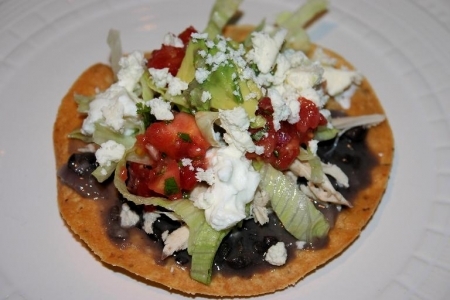 To assemble, spread bean mixture over tostada, and add remaining ingredients in this order chicken, lettuce, pico de gallo, avocado salsa, sour cream and cheese. Try a margarita – Classic Margarita, Prickly Pear Margarita or Guava Margarita. A great beer would go well too, try a light beer by Tecate, Dos Equis or a Corona with a wedge of lime. For children try Sidral Mundant. It is an apple soda that you can find in Mexican stores.